The wife and I decided to revisit FLORIDIAN this morning. This is another one of those that we classify under “older” new development, as it was first launched in mid-2007. FLORIDIAN is located off Bukit Timah Road – if you are driving up from town, you will have to turn left into the side road immediately after “The Nexus” (another condo). The sales gallery/showflat is at the actual site itself. The land that FLORIDIAN sits on is about 230,000sqft. There are a total of 336 apartment units spread over 11 towers of 10-storey each. The TOP was originally expected in 2013, but construction works have been way ahead of schedule thus far, so the TOP is now moved foreward to end-2011 or early-2012. • Downtown – Head to the rooftop for a game of tennis (2 courts) or take a dip in the lap pool with hydrotherapy facilities. • The Keys – The Keys is perfect for poolside dinner parties, and chilling out under the stars thereafter. • The Verandah – Occupying the highest point on the Floridian terrain, The Verandah offers spectacular views of the central waterscape, either from the tropical garden on the rooftop, or under the canopy of swaying palms on the ground level. • Hideaway – Where you will find beautiful cascading pools, alongside spa seats under the shade of swaying palms. • South beach – Themed-park inspired entertainment for children, while parents can indulge at the pool alcoves with jet massages, outdoor hot tubs and alfresco dining facilities. For parking, there will be a total of 360 underground carpark lots available in the development. This is where things get a bit murky – there are also “2+Study (2S)” and “3+Study (3S)” units within the development. The floor area info for these are not stated anywhere in the marketing literature or public domain, but we understand from the marketing agent that the size of a 3S unit is around 1658sqft. However, we have forgotten to ask about the size of the 2S units (paisei!). • Tower 7 (3S): Just released, so sales numbers not disclosed yet. • Tower 10 (2 & 4-Bedrooms): Just released all 2-Bedrooms, so sales numbers not disclosed yet as well. Towers 5 & 8 have also just been released, and these are supposedly the best facing – the front of each unit has full pool view, while the back has unblocked view of the good-class bungalow precinct along Old Holland Road. However, there is currently a pricing issue with these two towers. Apparently, Far East sold two 3S units in these towers during the first launch, reportedly at $1712 & $1750psf respectively. Now that similar units at the other towers are asking for much lower psf prices, there is some dilemma about what price to launch these towers at, given the need to protect the original buyers’ interests. Towers 3 and 11, which are considered by the developer as the “premium blocks”, are unreleased yet. The only showflat available is a 1658sqft, 3S unit. You get a private lift that opens to your private foyer, and a common lift that is accessible from the main door. The living/dinning room is a 6m X 6m square, with 60cm X 60cm marble-slab flooring and ducted air-con. The trapezoid-sized balcony is almost 100sqft, but the odd shaped design greatly reduced its functionality. You also get both wet and dry kitchens that come with “Teka” brand oven, hood & Hob. The wet kitchen is located in the yard area, together with the home shelter/maid’s room and toilet. The common bathroom comes with ceramic tiles flooring, “Newform” bathroom fittings and top-hung cabinet. Quality of the fittings especially the cabinet is average. The master bedroom is of decent size, while there is an option to convert the study next door to a walk-in wardrobe. The master bath has marble flooring/walls, separate shower stall & bath tub, and top-hung cabinet. Quality of the fittings is again average. The two common bedrooms are tucked inwards next to the study. Although there is no showflat for the 4-bedroom unit, we actually prefer the layout we saw of the scale model. The 4-bedder has a square balcony (more functional), and proper wet & dry kitchens that do not intrude into the yard space. The 4-bedroom units also supposedly come with better quality furnishings, and larger marble-slabs (90cm X 90cm) for the living/dining room floors. But we can only take the marketing agent’s words on these. • The living spaces are very functional – all rooms (except for some of the balconies) are regular with no odd shaped corners. • The access road that leads to FLORIDIAN runs about 100m from the main Bukit Timah Road. Thus the development will not bear the full brunt of traffic noise coming from the constantly heavy traffic flow along Bukit Timah Road, unlike some of the other condominium projects located along the main road. 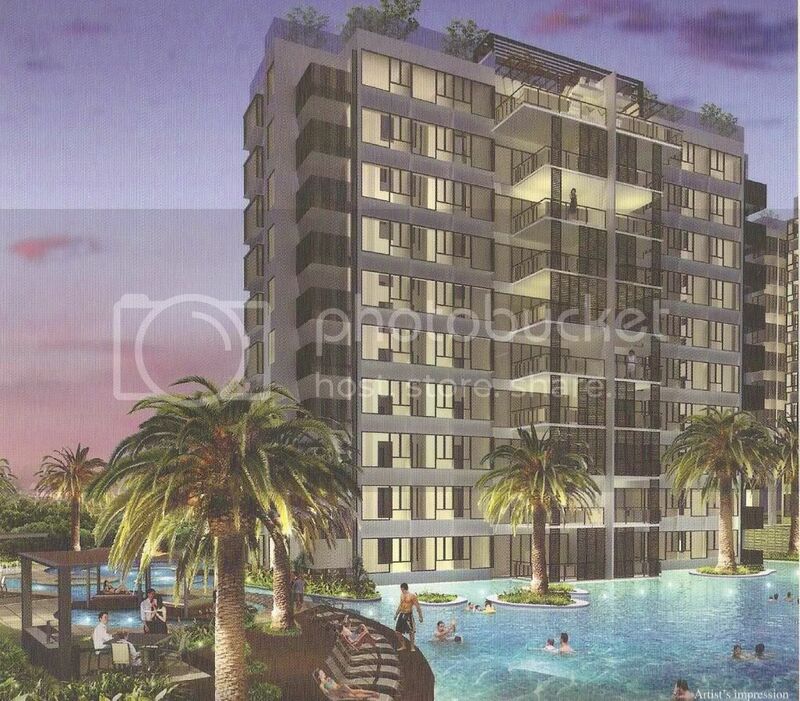 • FLORIDIAN is located very near to amenities at Bukit Timah Plaza and King Albert Park. It is also about a 15- 20 minutes drive to the City Centre/CBD. The future King Albert Park MRT station is supposedly 0.8km, or a 5 – minutes walk, away. • FLORIDIAN is surrounded by “Nexus” and “Maplewood” in front, and “Cascadale” on its right. Given that all these condominium projects are built to the maximum height allowance of 10-Storey (due to height restrictions imposed on apartments along Bukit Timah Road), some of the lower-floor apartment owners may feel a tad claustrophobic. • There is a small “design flaw” with the 3S showflat we saw today – the common bathroom is located in the living/dining room itself, while the 2 common bedrooms are tucked inwards next to the master bedroom & study. So occupants of the common bedrooms have to run out to the living room to use the bath/toilet, which is quite a distance especially when you have a bursting bladder. • The only primary school that is within 1-km of FLORIDIAN is Methodist Girls’ School – not good news for those parents with boys. • And most importantly - the price. The average cost of the 3S unit is around $1450psf, while the price of the 4-bedders averages around $1630psf. We felt this is rather high even for a FREEHOLD project despite the “Bukit Timah Road” address, and especially when we were hardly impressed by the quality of furnishings. In summary, FLORIDIAN will not be in our “shopping list” if we are looking for a new apartment in the Bukit Timah area. The Miami themed project with its unique enclaves may appeal to some, but we really do not think it represents good value for money. Even for investment (rental) purposes, the yield is likely to be reduced given the higher capital outlay. This is especially when you have to compete for tenants with the numerous new and old condominium projects within close proximity of FLORIDIAN. 4 comments to ''FLORIDIAN (Review)"
Its great to know that you visited floridian and we would love to thank you for that. I would just like to clarify some information that you have presented. Floridian is a FREEHOLD property and NOT a leasehold, therefore addressing the pricing concerns and the capital return. The new release towers (5 & 8) are both different. Tower 5 is a 3+S while 8, which is a premium tower is a combination of 3+S and 4. The tower are selling at a good rate of 1550 psf for tower 5 and 1700psf for tower 8. We havent released the tower 10 yet. For some 3+s, there are different layouts to choose from that may fit your needs as well, the layouts are flexible from tower to tower. 3. Cascadia will be asking 1500 - 1600psf for their some unist due to a contract signed with a conglomerate who bought 200-250 units. The best part in floridian is not the units itself, but rather the lifestyle and landscaping it offers. No other condo in bukit timah nor in singapore (I believe) offers 70% landscapping thus giving you 7 swimming pools and atleast 1 km jogging path. Dear Anonymous (Nov 09): Bias is when you totally favor one thing over another. We have looked over our reviews for both Floridian and Cascadia again (since it has been awhile since we wrote these), and failed to see how we were "biased towards cascadia". And the one thing that we can infer from the recent transacted prices is that Floridian is definitely more expensive than Cascadia... something we knew all along.